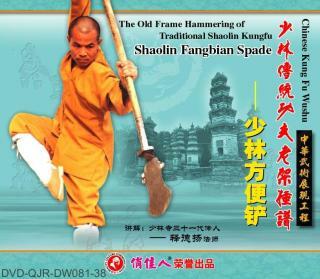 Shaolin Convenient Spade (Shaolin Fangbian Chan) belongs to the traditional long weapon series of Shaolin wushu. For geneartions as it passed down, the spade has been used by the Shaolin monks when they went out. The routine is primitive and decent, with no make-ups, the movements are extended and the frame is compact. Its style is unique and its form is powerful, forceful and vigorous. Its footwork and foot techniques are wonderful.